Standing in the Shadow: Whose Talent Are You Hiding Behind? Her brief, personal essays will inspire you to make changes, and her Take Action Challenges, which appear with comprehensive resource sections at the end of every essay, will guide you through small steps that will slowly teach you to think, act, love, work, and even laugh in a whole new way. 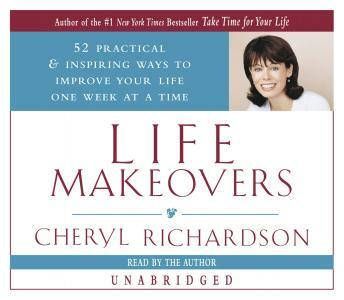 Written in Cheryl's signature, heartwarming style, Life Makeovers is the ideal book for anyone looking for a balanced way to reclaim their life one step at a time. How often do you daydream about living a better life—a life that reflects more of you, your values and deepest desires? How many times have you come to the end of a busy week and toyed with the fantasy of packing abag and leaving it all behind? The "Life Makeover" program is a powerful year-long program for change. It is designed to support you in changing your life one week at a time. Each chapter consists of a topic of the week and contains a Take Action Challenge and a Resources section to support you in taking action quickly and easily. Be prepared for your life to unfold in wonderful ways. As you clean up the clutter, reconnect with your inner wisdom, strengthen your character, and take on the challenges of high-quality living, you'll find that the lost parts of yourself start to come together to form a pretty amazing life!